Home » Fishtail Hospital And Research Center Pvt. Ltd.
Fishtail Hospital And Research Center Pvt. Ltd.
Nepal is rich in natural resources, though due to lack of proper utilization of such resources large percentage of people here are suffering from various problems. In the beginning of 21st century we are suffering from insufficiency, diseases, unemployment, illiteracy and many NGOs and INGOs are working to resolve these issues. Nepal government alone cannot reach the margin of social changes as well as development to achieve the mainstream path. The proprietors felt the need to work hand in hand with social organizations, nepal government, NGOs and INGOs, so a group of social worker and doctors formed a 25 bed hospital in 2055 B.s. and was inaugurated in Falgun 2055 by speaker Ram Chandra Poudel. They extended their services to 50 bed in 2061 B.S and are dedicated to make private health services accessible to all people in western region. They are centrally located private hospital owning own building with the facility of elevator covering the area more than 60,000 sq ft in Pokhara valley. 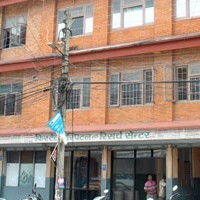 The hospital is now multi-disciplinary 100 bed care hospital confidently providing comprehensive health care in Pokhara. They now provide latest Medical, Surgical: General Surgery, Orthopaedic and Neurosurgery, Gynae and OBS, ENT, Ophthalmology, Neuro Psychiatry, Dermatology, Dental, Physiotherapy and diagnostic facilities. These services are provide by the expert team of medical professionals, skilled nurses. Specialist Services: Medical, Surgical; General Surgery, Orthopaedic and Neurosurgery, Gynae and OBS, ENT, Opthalmology, Neuro Psychiatry, Dermatology, Dental, Physiotherapy and diagnostic facilities. Well equiped lab, X-ray, and other diagnostic facilities. Pharmacy and cafteria in the hospital premises. General health checkup as a package facility. 50% Discount for aged people 80 and above. Initiation of Proficiency Certificate Level in Nursing (Staff Nurse) to produce Skilled manpower. Planning to operate 200 bed multi disciplinary hospital. Planning to run Post Basic Nursing (Bachelor of Nursing).